The architects of this 'state-engineered modern-day genocide' are not gangsters or despots but genteel bureaucrats, industrialists, politicians, SC judges. "We will request you to move from your houses after the dam comes up. If you move it will be good. Otherwise we shall release the waters and drown you all." This is not a mafia don from a Mario Puzo novel presenting his victims with an "offer they can’t refuse". It is Morarji Desai in 1961, the then finance minister of the Indian Republic, speaking to its citizens who came within the submergence zone of one of its big dams – the Pong Dam in Himachal Pradesh. Desai, who went on to become the prime minister in 1977, could, however, be excused the gangland tenor of his threat. He was, after all, only doing his duty and honestly expressing the cold non-negotiability in the coercive intent of the Indian State when it came to questions which it considered to be about "development". The same coercive intent continues to this day. It is right now on full display in a violent drama of epic proportions being enacted on and around the banks of the Narmada, where the oustees of the Narmada dams are resisting the latest round of aggressive actions being perpetrated on them by the state. On August 7, a 2000-strong armed horde of policemen and other security personnel was deployed to lift a frail and aged Medha Patkar, along with five others, from the site of their 12-day-long hunger strike. The strike was in protest against the latest round of state-planned flooding, which aims to see 40,000 households being flushed out of their homes without any promise of their rehabilitation. According to the government this deployment of such a huge force was necessary to save the hunger-strikers’ lives by providing them medical aid. However, two days later, when Patkar had taken medical help and was proceeding back to the hunger strike site, her transport was encircled by 35 police vehicles and she was taken to jail. Despite doggedly sticking to the path of total non-violence, the Gandhian hunger striker has now been arrested by the Madhya Pradesh Police in four cases, including one of kidnapping, carrying a punishment of up to seven years' imprisonment. Thousands of more para-military personnel are waiting in the wings, tasked with the forcible eviction at the point of a gun of lakhs of forest dwellers from their ancestral abodes. Whole communities will see the end of the world as they have known it; the livelihoods, also the lives, of thousands of families will be destroyed. The Patkar-led National Alliance of People’s movements (NAPM) accurately calls it “state-engineered modern-day genocide”. The architects of this genocide are, however, not men known for their cruelty or tyranny – they are not gangsters or despots. They are the genteel technocrats, bureaucrats, industrialists, politicians, Supreme Court judges and the like who have drawn up the plans, served on the committees, drawn up the rules, signed on the judgments that have resulted in lakhs being driven from their homes with scanty hope of a similar alternative existence. They are, with the rare exception, all highly learned and cultured, and many perhaps have never been known to have personally hit or physically hurt any human being. They are, however, all united by a commitment to a horrendous level of violence, which the most vicious convicted criminal would not even be able to contemplate, let alone commit. Clad in the rhetoric of self-sacrifice for the sake of the nation, Nehru’s words did not, however, disclose how that story of suffering and sacrifice would not only be calamitous, but also be extremely selective and discriminatory against the most exploited and oppressed of this land. One estimate in 2000 said, "In India, during the past 50 years, more than 50 million people have been uprooted from their homes and huts, displaced from their farms, jungles and rivers and sacrificed at the altar of 'national interest'." Another study found that adivasis, who constituted 8 per cent of the total population of India at 1991 Census, make up 55 per cent of the total displaced persons due to development projects up to 1990. Thus, the model of development chosen by the state not only ensures that a tremendously large number of the people have to experience utmost misery, destitution and destruction due to this "development"; it has also targeted the most vulnerable sections to be the ones who, as Nehru said, “should suffer in the interest of the country”. In the case of Narmada valley too, most of those displaced belong to the Scheduled Tribes – one study placed it at 60-70 per cent of the total. All organs of the State have been complicit in the violence. 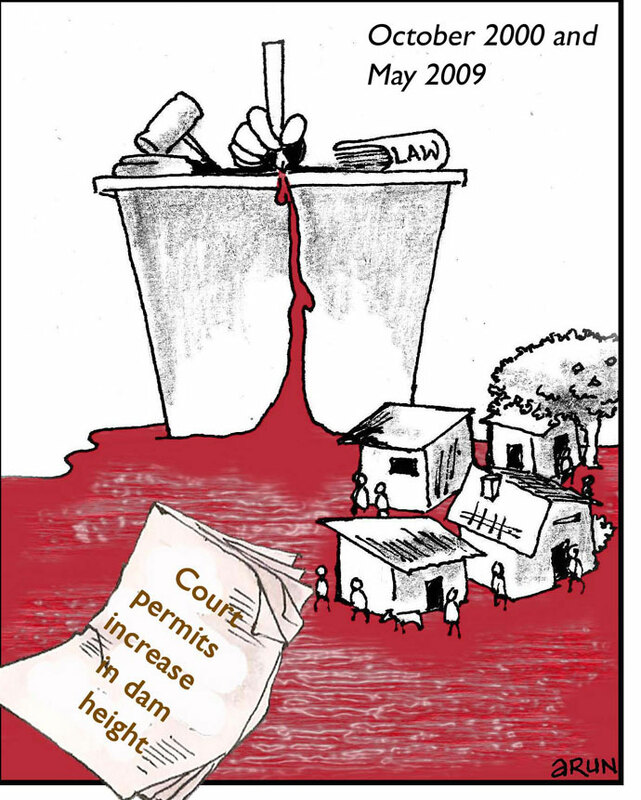 The Supreme Court has twice permitted an increase in the height of the dam that has, each time, drastically increased the numbers who have been chased out of the valley without even being rehabilitated. Governments have made deliberate false statements claiming total rehabilitation and then gone ahead and flooded larger areas and submerged more villages. The present flooding is one more in a long line. This time the people have resolved not to move from their homes unless they are fully rehabilitated. This doggedness may seem unreasonable to some, but going by the past record of the Indian state, their position is only understandable. It is well-known that once the villagers vacate their homes, they can have no hope of any rehabilitation. The Pong Dam submergence area dwellers addressed by Morarji Desai in 1961 were ousted in 1974, but over 40 years later they are still awaiting the land and rehabilitation they were promised. But, despite the determination and dedication of the valley people and the activists of the NBA, those who command the organs of the state are ruthlessly bulldozing ahead. It is therefore unlikely that the fate of those on the Narmada would be far different from the horrors that the Pong oustees experienced. There in 1974, the people in the submergence zone "suddenly found the water rising and many were forced to run for their lives leaving their property to be submerged. In fact, several unfortunate oustees who had not been quick enough had been drowned. Most people lost their crops". Morarji Desai was a part of the government then, but his threat of 1961 had been fulfilled by the State. 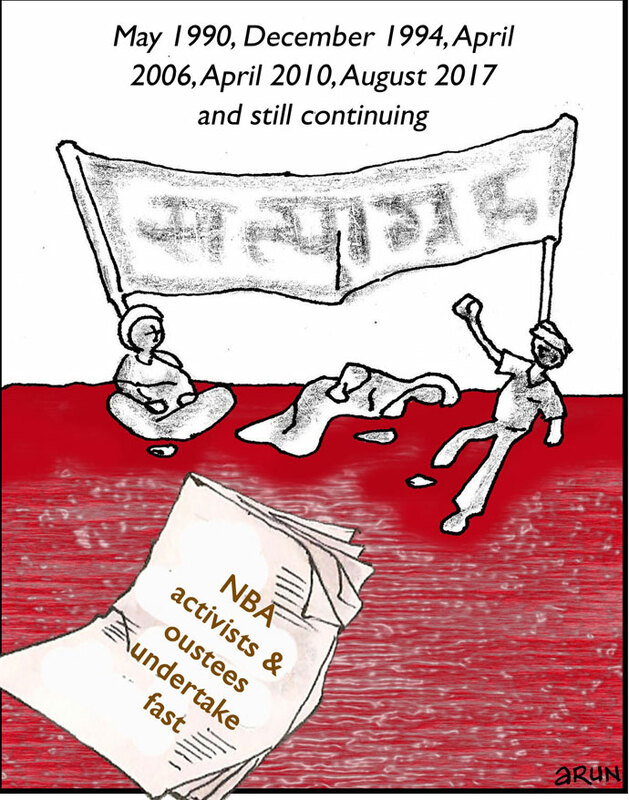 Medha Patkar and the Narmada Bachao Andolan (NBA), who have led the resistance of the people of the Narmada valley since almost 30 years, have been remarkably consistent in their insistence on non-violence. The NBA has been often held up as "an international icon of non-violent protest", without a single instance of resorting to deliberate violence to achieve its ends. Its main weapons have been propaganda, marches and rallies, lobbying with those in decision-making positions, petitions in courts and the moral pressure of hunger strikes. The NBA was successful in creating sufficient opinion in international fora to force the World Bank to withdraw from the project. However, that has, in no way, stopped the Indian State from continuing on a course of violent implementation of its "development" plans and bloody suppression of all resistance to it. This has forced the NBA, which started off on an agenda that directly opposed dam construction altogether, to retreat from that position to one of acceptance of the dam, provided there was minimum displacement with proper relief and rehabilitation. This too has, however, proved unachievable, despite the perseverance and commitment of the NBA and its supporters. As the waters rise, the Supreme Court has slammed its doors on a plea from the NBA for intervention. With no hope of moral pressure producing an impact on any branch of the state apparatus, the imprisoned Medha Patkar had no option but to give up her fast on the 17th day without any result. Thousands of oustees have been implicated in false cases and many of the leaders have been put behind bars. The leaderless masses outside are now valiantly digging in their heels, but have no real options in the face of the might of the State. They now confront a situation which Patkar had seen coming for some time. 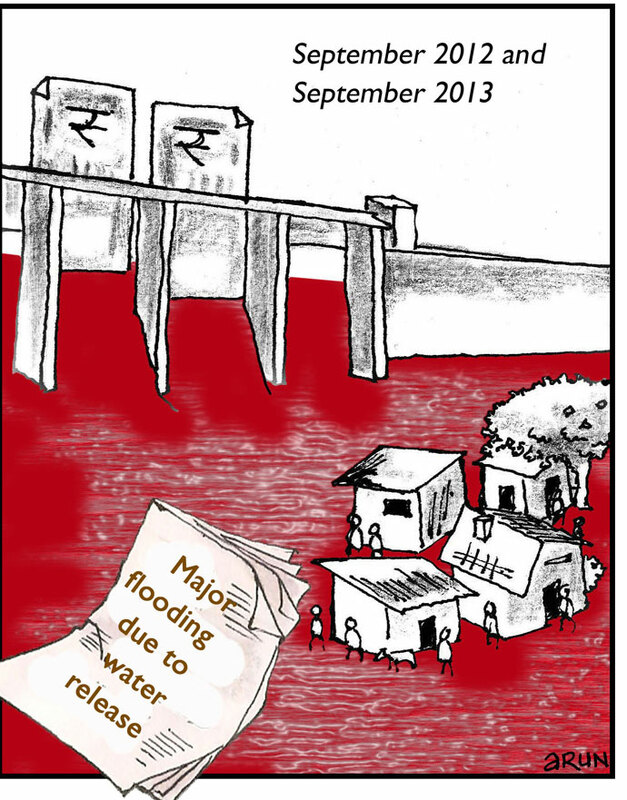 As the state armies now advance, armed with a mandate to turn the Narmada red with the blood of their victims, this may well be the question running through the oustees’ minds.